Such a delight to slip into at the bedside first thing, you'll want to keep them on all day! 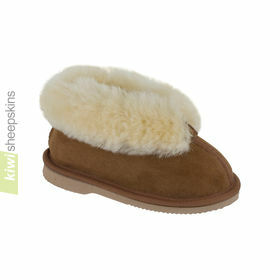 Kiwi sheepskin slippers - just so cozy and warm on a winter's evening. Slip-on slipper styles - great comfort in the morning throughout the year. Rolled Collar Scuffs featuring a soft hide sole, just perfect for indoors. 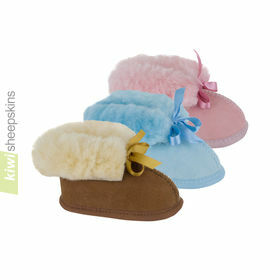 Slip on a pair of luxurious Josie Scuff slippers and feel the genuine sheepskin. Our sheepskin slippers are proudly made in New Zealand to our high standards using only genuine New Zealand or Australian sheepskin that has been tanned specifically for footwear use. Premium twinface sheepskins are used whereby the wool is still attached to the sheep skin leather. All sheepskin products including our footwear comes with our 12 month warranty. Check out our testimonials page for reviews and feedback specific to our sheepskin slippers category or see each product's Testimonials tab. We have numerous delighted international customers including from USA, Canada, UK and Australia. 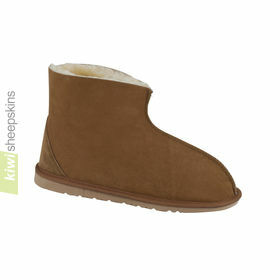 See our highly rated Kiwi Sheepskin boots for even more warmth and our Ultimate outdoor footwear. SALE NOW ON - ALL slipper and boot styles reduced! The hard sole version of our New Zealand made bootie style of sheepskin slipper features an ultra flexi TPR side-stitched sole. Hide sole version of our booties for those who prefer a soft sole for indoor only use. 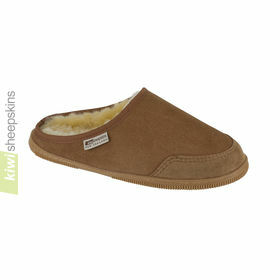 Our best value slipper and still made in New Zealand. 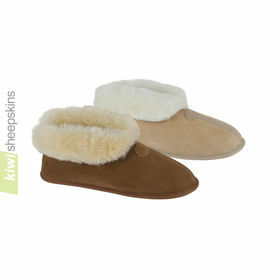 Hard sole sheepskin slippers for both men and women featuring a lightweight EVA sole. Unisex sheepskin house slippers in a clog style that are easy to slip on and off. Top-of-the-range sheepskin slippers in a slip-on clog style. Predominantly a man's slipper but suitable for anyone who wants a beautifully made shearling slipper in a traditional style. Particularly popular with our UK customers. 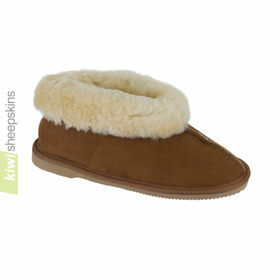 Made in New Zealand from premium quality twinface sheepskin throughout. 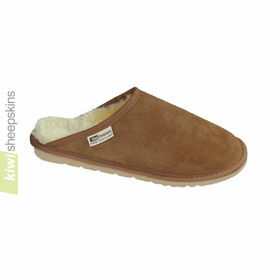 Genuine New Zealand made sheepskin slippers - easy slip on scuff style. 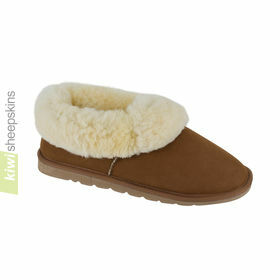 Soft sole women's shearling sheepskin slippers. Easy to slip onto your feet first thing in the morning or as soon as you arrive home. Most people wouldn't normally wear their sheepskin footwear in bed. Now you can with our slipper socks! Please note our manufacturer has been having problems sourcing the slipper sock fabric in the Chocolate color for some time. This has caused us to go out of stock of nearly all sizes in this color. However, we have good stocks of the natural/white color. Children's version of one of our best selling items of footwear, the bootie slipper. Hand crocheted baby bootees made from finest Perendale wool with lambskin soles. Baby booties featuring real sheepskin throughout. 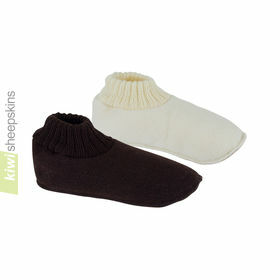 The wool side of the sheep skin naturally moulds to baby's feet. Note the blue color is being discontinued so some sizes are not available in this color. 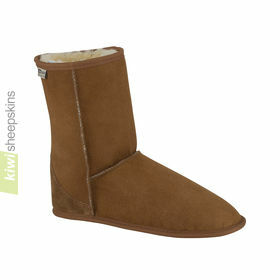 Luxuriously warm soft sole sheepskin house boot. The comfort of sheepskin slippers with the height of an ankle boot keeps your feet and ankles cozy and warm. To allow fitting into almost any footwear type, the insole pair are made from pure lambskin with no backing. Simply trim to fit and glue into place. 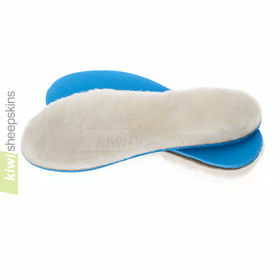 Direct replacement sheepskin insole for our side-stitched sole Ultimate range of sheepskin boots. The soft leather side of twinface sheepskin footwear is easily stained so we highly recommend using this protector before use.